The prices quoted in the fib bookshop are in Swiss Francs (CHF) excluding shipping, packing and order processing costs. They may subject to change without notice. Catalogue prices of electronic publications are given for one single user. The prices of the fib products do not include duties and taxes. The purchaser is responsible for all duties, taxes and custom fees. The fib headquarters is located in Lausanne and registered in the Canton of Vaud, Switzerland for tax purposes. The Trade Register registration number is CHE-112.232.109. The federation is subject the law of Canton of Vaud. The fib Membership is for calendar years regardless of the payment date. The fib Membership subscription is renewed automatically unless terminated in writing received by the fib Secretariat on or before 30th September of the current year of subscription period. The fib online credit card payment is processed by Paypal and Saferpay. 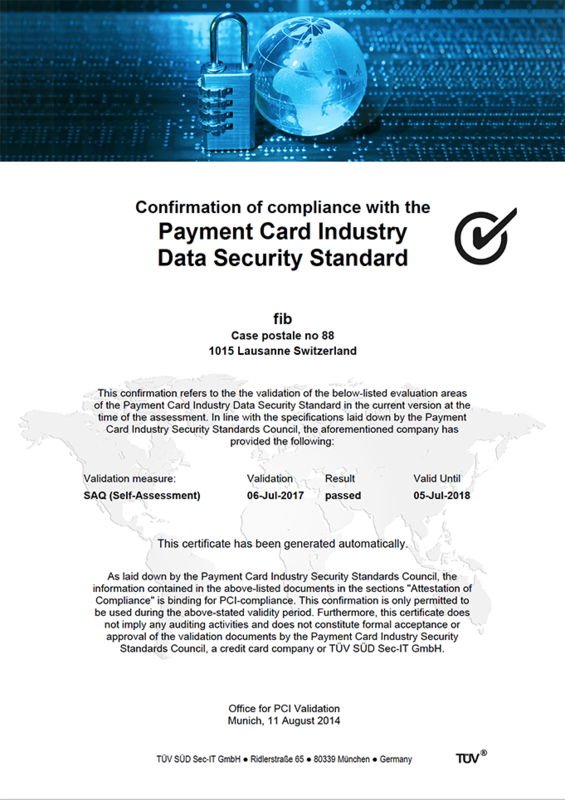 Online payment is certified by to be in compliance with the payment card industry data security standard. * Please note that a bank transfer may take 1 to 3 days to be effective. You may order on-line on this site. The different stages of logging your order are validated successively, with final validation at the end of the process. The user can decide to abort the order at any stage of this process. The fib reserves the right to cancel or refuse any order from a customer with whom there is a dispute concerning payment of a previous order. For products published in partnership with other publishers, you must send your inquiries and orders directly to those contacts. The fib's offers of products and prices are valid for as long as they appear on the site. The fib will supply goods ordered depending on the availability of stocks or as pdfs version. Delivery is made to the address given when you order. Delivery times are approximate and represent average delivery times. For orders from outside Europe it is strongly advised to use DHL or at least airmail. fib will not be responsible for surface mail deliveries. The fib may not be held responsible for any consequences of a delay in delivery, particularly in the event of a force majeure, computer breakdowns, and disruption or strikes affecting postal services, transport or communications. Please see also point 4 Terms and conditions for sales. In order to improve the quality of its documents the fib encourages purchasers and users of our documents to send their feedback to the fib’s secretariat. Canton Vaud, Switzerland, shall be the place of performance and Vaud, Switzerland, shall be the exclusive place of jurisdiction for all disputes. The legal relations between the fib and the customer shall be governed exclusively by the law of Vaud, Switzerland. This provision shall also apply to legal transactions via the internet. These general conditions of sale are governed by the law of Canton Vaud, Switzerland. While the fib aims to insure that its publications represent the best in business practice, the Federation accepts no liability for any events or the consequences thereof that derive from using information published by the fib. The fib also disclaims any and all responsibility for any information attributed to the fib on web sites not emanating from www.fib-international.org. The fib bears no responsibility and does not endorse any links www.fib-international.org from WWW pages residing on other domains. Any draft documents residing on this site and intranet are in the process of being developed and have not at this time been approved by the fib for use or reference. The fib disclaims any and all responsibility for application of the stated principles. The fib shall not be liable for any loss or damage arising therein. Access to these documents must be given by the fib or a representative of a technical, educational, certification, or convention committee designated by the fib. The fib also assumes no liability regarding the accuracy of the information that is provided and use of such information is at the recipient's own risk. Under no circumstances shall the fib be liable for any loss, damage, liability or expense incurred or suffered that is claimed to have resulted from the use of the fib -supplied information. The opinions of fib social media channel creators, moderators, posters and commenters are their own, and not necessarily that of fib or its affiliates. Copyright © 2018 fib International Federation for Structural Concrete. Fédération Internationale du Béton, Case Postale 88. CH-1015 Lausanne. Switzerland. All rights reserved. The fib is the Copyright owner of the fib, CEB and FIP publications, that can be shared with other organisations, which are protected by the Berne Convention for the Protection of Literary and Artistic Works, international conventions such as TRIPS and the WIPO copyright treaty and national intellectual property laws. No part of a fib publication can be reproduced, translated, adapted, stored in a retrieval system or communicated, in any form or by any means, mechanical, electronic, magnetic, photocopying, recording or otherwise, without prior permission in writing from the fib. The fib regularly updates and reissues the information and services it publishes so that users can profit from the state-of-the-art. By furnishing information or supplying publications, the fib does not grant any intellectual property rights The purchase or supply of the fib information, including forms for completion by a user, does not confer author's rights under any circumstances. Consequently, this information cannot be published as translations or copied without the fib’s permission. The fib discourages modification of the information and services it supplies, and only in exceptional circumstances will it authorise modification, reproduction or incorporation elsewhere. Request to quote from, incorporate, reproduce or copy all or part of the fib publication, including documents, conditions of contract, web pages and similar supports for information shall be addressed to the fib Secretariat, which will decide upon appropriate terms. A license to prepare a modified publication may be agreed to under certain conditions. The widespread dissemination, acceptance and use of the fib’s publications and their translations are important means for accomplishing fib’s mission and are therefore actively promoted by the fib. The fib regularly updates and reissues publications so that users can profit from the state-of-the-art. By supplying publications, the fib does not grant any intellectual property rights. The purchase or supply of a fib publication, including forms for completion by a purchaser or authorised user, does not confer author’s rights under any circumstances. Users rely on the contents of the fib publications. The use of authentic publications is therefore essential for safeguarding their interests. The fib discourages modification of its publications, and only in exceptional circumstances will it authorise modification, reproduction or incorporation elsewhere. Permission to quote from, incorporate, reproduce or copy all or part of a fib publication should be addressed to the fib Secretariat, which will decide upon appropriate terms. A license to prepare a modified or adapted publication will be agreed to under certain conditions. Specifically, the modified or adapted publication must be for internal purposes, and not be published or distributed commercially. The fib reserves all rights of ownership to designs owned and used by the fib (collectively referred to as "logos"). The fib National Member Groups and Corporate Members are encouraged to use the fib logo. For convenience, they can use the logo without seeking explicit permission or a license provided the logo is not modified or imitated and not incorporated in any manner into other devices or designs. The fact that permission or a license is not expressly granted does not imply that the fib relinquishes its rights. Other organisations and all individuals must receive the fib’s authorisation in writing in order to reproduce and use the fib logo. The fib reserves the right in its sole discretion to terminate or modify permission to display the logo, and may request modification or deletion of any use of the logo that, in the fib’s sole judgment, does not comply with guidelines, or might otherwise impair the fib´s rights. The fib does not require specific permission from third parties that want to place a link on their web site to a fib web page. It does not object to such links if they refer to the fib in a plain text font and format, and use appropriate wording such as "Contact the fib". The fib’s policy is to ensure that authors' rights to the fib published information belong to the fib irrespective of it source. Consequently, contracts for the provision of all forms of intellectual content will generally stipulate that the content belongs to the fib. The same applies for content generated by properly constituted committees and the like. Unless otherwise specified, the services and information provided on the fib website are for personal and non-commercial use. Users may not otherwise modify, copy, distribute, transmit, display, perform, reproduce, publish, license, create derivative works from, transfer, or sell any information obtained from the site. By accessing, browsing and/or using the fib web site, a user acknowledges that he or she has read, understood, and agreed to be bound by these terms and conditions. The fib journals, books and other publishing products shall be supplied exclusively subject to these Standard Terms and Conditions for Sale, Delivery and Payment. Deviating terms and conditions which may be used by the customer shall, unless the fib has expressly acknowledged them in writing, not be binding for us, even if the fib does not expressly object to such terms and conditions. Please refert to part 3.1. Copyright Notice. Only written orders shall be decisive for the nature and extent of the fib obligations. This shall also apply in cases where the fib makes reference to the order. The customer shall be bound to his/her order. An order shall no longer be binding if the fib neither confirms the order in writing, nor ship the ordered. The fib written order confirmations shall be decisive for delivery dates and delivery periods. In cases of force majeure or other unforeseeable or extraordinary events, or in cases where such circumstances were not due to a fault on its part, the delivery period shall be extended adequately. Should such circumstances make delivery impossible or unreasonable, the fib shall be released from its delivery obligation. If a delay is unreasonable, the customer shall also have the right to withdraw from the contract. Should the fib be in default with a delivery, the customer shall have the right to set an adequate period of grace for a subsequent delivery. Should the fib not perform during this period, the customer shall have the right to immediately withdraw from the contract. The risk shall pass to the customer upon dispatch of the goods or their delivery to the forwarder, however, not later than upon the goods leaving the publisher's premises or the warehouse. The goods to be delivered shall only be insured if the customer expressly so desires, and at the customer's cost. Please also see point 1.8 Delivery. The fib's book prices are quoted ex your shipping location, when given, incl. packaging and economy freight. They do not include value added tax as it is not applicable. The price and availability of publications sold on the fib website are subject to change at any time, without notice, at the discretion of the fib. Publications sold on the fib website may be available either as printed books, PDF files, or both. The content of the PDF and printed versions is identical; they are therefore considered to be interchangeable and are sold at the same price. Listed prices are non-member prices; discounts are given to the fib members and for large quantity orders (4 or more). All prices are in CHF; payment in other currencies is not accepted. Payment is accepted by credit card (Visa, MasterCard) or bank transfer. Except for the payment by bank transfer, the publications will be shipped after receipt of the funds. Unless separate agreements have been made, the fib's invoices shall be due for immediate payment upon their receipt by the customer. The invoice number is to be quoted when effecting payment by bank transfer. Publications are shipped against advance payment. Due to costly processing fee, checks are no longer accepted. Payment via bank transfer, Paypal and credit card are preferred form of payment. Returns are not accepted for claimed purposes; copies with printing or binding defects will be replaced free of charge. All publications purchased from the fib are made pursuant to a shipment contract. This means fib's obligations with respect to purchased publications and their final delivery to the customer end when the publications are passed to the carrier for transport. The fib accepts no responsibility or liability for events that transpire following its fulfillment of the shipment contract, including but not limited to postal delays, lost parcels, and customs disputes, fees, or delays.